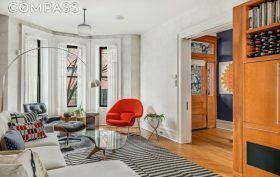 On a quintessential Park Slope street lined with brick homes a block from Prospect Park, behind a cheerful pair of cobalt blue doors, this well-maintained, intelligently updated two-family brownstone has a move-in ready mix of historic detail and modern ease. Built at the turn of the 19th century, the 20-foot-wide home at 510 7th Street is currently configured to offer a garden-level one-bedroom apartment with a duplex above for an income opportunity in a high-rent neighborhood; it easily converts to a single family for more space, and it’s a legal three-family so three units are also an option. The three-story home is asking $2.999 million.